It was an exercise in communications and my partner and I were not doing well. It was obvious, we used language differently and those differences created an atmosphere of irritation and distrust. At a distance, I realize I should have clarified my terms; asked her what I wasn’t making clear. In the moment, I was too frustrated and too trapped in my feelings of failure. I don’t like failure even though I recognize that often it is the best teacher. The lesson, alas, only came later. At the time, I kept on, using the words that made me comfortable; words that had meaning to me. The fundraiser in me recognizes that trap. We develop our case; hone our elevator speech—in short, we think about what we need and what resonates with us. Oftentimes, that works. Our passions match the passions of others; what matters to us, matters to someone else; the words we use are the words of others. But sometimes, we end up as I did in that communication exercise, talking but not communicating. My partner and I both got frustrated and didn’t much like each other. Remembering to define terms, clarify intentions, check that we were in sync—and if we weren’t, finding out what I could do to help get us in sync—would have gone a long way to making an unpleasant situation more palatable. On the plus side, it was only an exercise. When you are fundraising, the stakes can be far higher. Miscommunication can be devastating. Forgetting that communicating is a two-way street can be somewhat more disastrous. As that old chestnut about us having two ears and only one mouth should serve to remind us, good communication is as much about listening as it is about talking. Too often, we tell our prospects about our needs and forget to find out about theirs. That turned out to be quite unfortunate. Another of the donor’s philanthropic interests DID ask, and then crafted a proposal asking for an extremely large gift that responded to the donor’s stated vision. The result? The first organization ended up with a heartfelt “sorry, but…” while the second not only got a very large gift but made their donor very, very happy. And that will have ramifications for both organizations in the future. 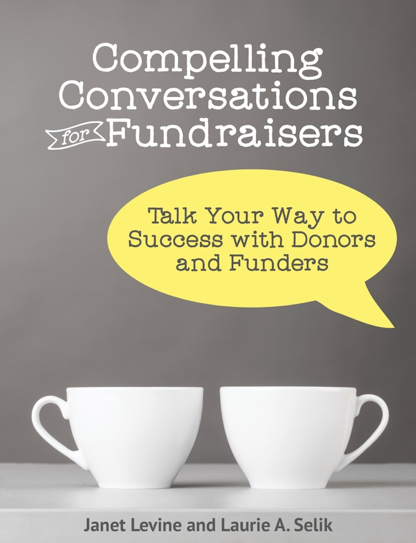 Successful fundraising, like effective communication, focuses on the other, or—to quote my husband—it’s not about you. It is about ensuring you are speaking in a way the other person can understand, asking for a gift that means something to the donor, putting the other person’s needs and wants and desires at the forefront. This entry was posted in communication, fundraising and tagged communications, fundraising. Bookmark the permalink.